During the school year, students are expected to shop for both “just right” fiction and non-fiction books to read during Reading Workshop and at home. As students level up in reading, different fiction books become available to them. A challenge I face is how to keep students engaged in non-fiction reading when they have access to the same non-fiction library all year. I am constantly on the lookout for new, exciting non-fiction texts that I think my students will find interesting. This year, I subscribed to Sports Illustrated Kids and National Geographic Kids magazines, which were a huge hit. When we were in research units, I supplemented the classroom library with books from our school’s library media center as well as the local public library. 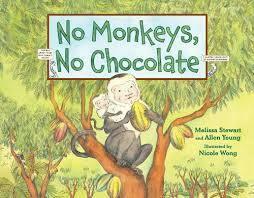 Our literacy coach recommended No Monkeys, No Chocolate by Melissa Steward and Allen Young. The title alone captures the reader’s attention. Without monkeys there wouldn’t be chocolate?!? You simply must read on to find out the connection between monkeys and chocolate. This deeply scientific text with fabulous, detailed illustrations describes the interdependence of animals and plants in nature. At the same time, the book is infused with puns, humor and some disgusting facts that keep the reader engaged. No Monkeys, No Chocolate is great as an independent read for students in grades 4-6. I selected this text as a whole-class read aloud through which we analyzed how the authors’ craft moves brought out the deeper meaning of a non-fiction text. For example, how the book uses the much-loved topics of monkeys and chocolate to bring attention to the preservation of rain forests. Another high-interest non-fiction book is Mistakes that Worked by Charlotte Jones. 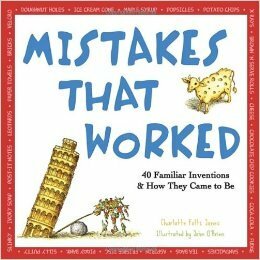 Like The Kid Who Invented the Popsicle, Mistakes That Worked features 40 popular inventions that were the result of mistakes. This book includes the invention of donut holes, piggy banks, and even VELCRO. Descriptions of the inventions are accompanied by comical sketches and interesting facts. It teaches the reader that taking risks can result in amazing, never thought of before creations. Unlike No Monkeys, No Chocolate, Mistakes That Worked is the type of non-fiction text that does not have to be read from cover to cover. It encourages the reader to use the table of contents to identify the parts of the books that would be of most interest. What high-interest non-fiction texts do you have available in your home or classroom libraries?